Do you know why keeping the cellar environment is so important to wine quality? Have you considered how things like air flow and dust can potentially cause problems with your wine? Energy (because your time is spent doing more creative and detail-oriented work)! Yet with SO MANY benefits, I often see winemakers and cellar staff taking short cuts in the cellar with a “belief” that small sanitation steps do not actually matter. Thankfully, we’re going to approach sanitation the DGW way: with some fun, lighthearted conversation, and key “how-to’s” to make your cellar work for you. That’s right: DGW’s Darn Good Winemakers is hosting their December webinar on sanitation strategies that anyone can master starting now! Why sanitation is an important in wine production. This will include the identification of key benefits good sanitation practices provide. The microflora of wine: what’s in there and how does it affect the wine? Also, how long are these microbes in wine? A basic sanitation strategy: how to prepare equipment pre- and post-operations. We’ll also cover the benefits to maintaining repetitive sanitation strategies and why they matter. 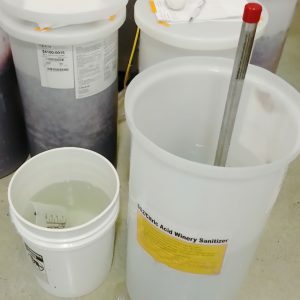 You’ll walk away knowing how to properly clean and sanitize that wine hose or receiving tank for your next wine transfer. You can find more information about the Darn Good Winemakers, here. Now through December 31st, 2018 the price for 12 consecutive monthly webinars and the open Q&A time following each webinar is a total, one-time fee of $350. Your registration will provide you with instructions to access the “Practical Solutions for Improved Winery Sanitation” webinar and your next 11 webinars!